This chart with data from Eurostat shows the average change in the house prices in the EU since the credit crisis really started to break down in the United States, the second half of 2008, until the third quarter of 2012. Countries known for being in a big crisis at the moment saw the largest declines in their house prices, mainly Ireland and Spain. The Netherlands and Denmark have to highest household debt-to-gdp ratio's in the world and saw their house prices declines a lot as well. The last group of countries on the downside are several East-European countries for which Latvia and Lithuania saw big declines. 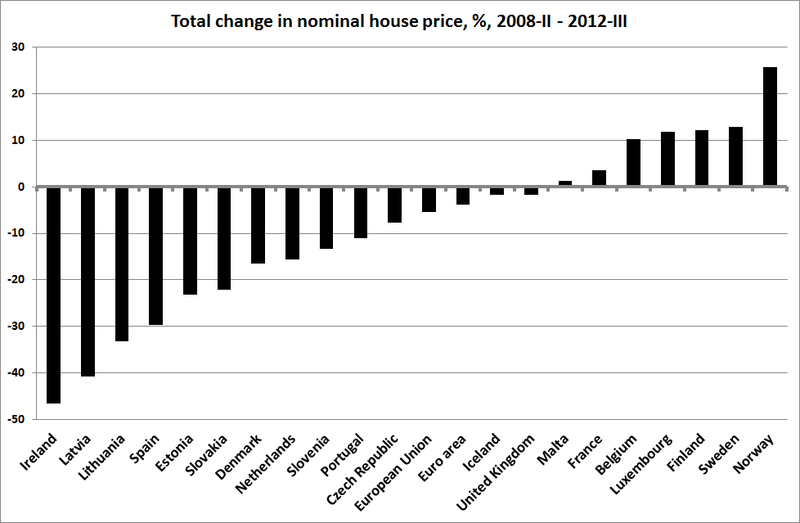 In contrast, three out of four Scandinavia countries had their house prices increase substantially. Really great info you have shared with us thank you so much.